House on the Hill: covered in threads/pillows upon pillows! covered in threads/pillows upon pillows! 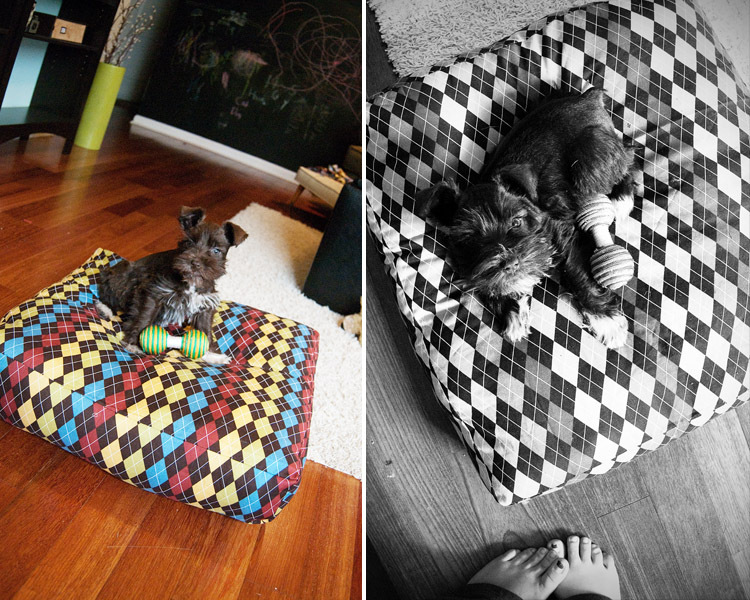 ( new sentence ) while i was on a roll and my living room and myself were covered in threads, i decided to go ahead and make winston the pet bed i have been meaning to make since before we got him! i wanted to go to the fabric store and pick out some cute fabric and something that was good on wear and tear for the bottom but we never manged to get over that way. i found this material that i have had for awhile and it just screamed 'WINSTON' ( don't you think?) it turned out so cute and he is passed out asleep on it right now... it was so funny b/c it was like he KNEW it was his lol! it is a little bigger than i initially meant to make, but he will get about 25lbs so he will grow into it. I love the material, and I think the size will be perfect. Very good job. Cute toes!!! I love how you used two pillows! I'm so flattered you were insipred by me. Thanks for sharing these, they are lovely. thank you for the inspiration amy and for stopping by! Ohhh - those pillows are fabulous! My husband is from Ohio and I am from Canada... can totally make this work for us! Love that you are putting them on your bed - great idea!